You could just give yourself colours or numbers if you wanted to but it is a lot of fun to picking names. In some cases the team names have a great meaning to the people on the teams. Perhaps you want to commemorate an event or a particular person. Picking a name that inspires the group may encourage more focused participation. If you have started your own Weight Loss Competition at work or with friends, you probably will be dividing up into teams and picking your weight loss team names. Picking a funny name makes for great fun to print up on t-shirts or pinnies. 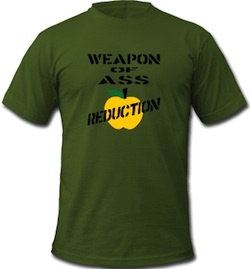 Things like: Wii-Win, Weapon of Mass Reduction, Waist Removal, or Waist Not. Keep the names light and there no need to insult yourselves with negative terms. Other weight loss team names could be about the company you work for or the department your team is in. – Bottoms Out for the machining department. 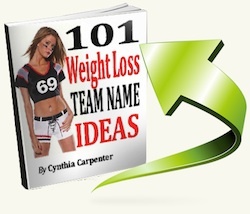 [CLICK] if you still need 101 MORE clever weight loss team name ideas? Don’t forget to grab your FREE copy of the Weight Loss Challenge RULES. Picking team names for weight loss challenge can get fun and silly, so enjoy the process. You might want to think about having a few flyers and a t-shirt for everyone too. 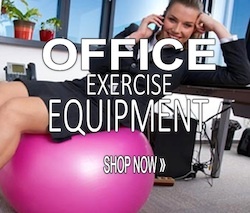 Have fun with it but don’t insult anyone – especially your boss if this is a Weight Loss at Work Competition. You wouldn’t want to call it “Doug-be-Gone” if his name was Doug. Another way to come up with team name ideas is to brainstorm using plays on words. Perhaps drawing on TV shows or movies, like Carrots of Fire, or maybe phrases that give you an acronym. Whatever you chose you know you are going to have fun. Read more team weight loss competition ideas.